During the course of operational and investigative measures, Anar Alakbarov, a resident of the city of Mingachevir, was detained by the State Security Service of Azerbaijan, on charges of being suspected of state treason, Trend reports citing the information of the public relations department of the State Security Service. It was established that Alakbarov, while being in the territory of a foreign state, was recruited by secret service agents for an cooperation in exchange for financial resources in March 2016. 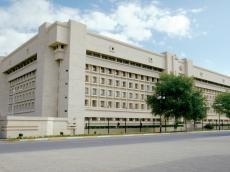 These persons instructed Anar Alakbarov to collect information about certain citizens of the Republic of Azerbaijan who have trade relations abroad, to link them under the pretext of business relations with intelligence agencies, and also to collect information about employees of intelligence agencies of Azerbaijan and representatives of embassies of specific countries operating in Azerbaijan, and the military units of the Ministry of Defense of Azerbaijan. Anar Alakbarov took concrete steps to this end over the past period.